It was working fine, then, after I made an adjustment - moving the image behind the mask 350 pixels to the left - (which used to take about 10 seconds in DrawPlus with the crop tool) export insists that the image is 350 pixels than it is and the jpeg exports with 350 pixels of white space beside it. Navigator shows the correct size when I select the full image. Something as basic as this shouldn't be having problems. Now I have to rebuild the entire diagram and try to work out what the problem is. I have an image showing the problem which is attached - the Transform shows one set of W,H, the export box shows a different set of figures, largely, it seems, because the vector mask stops masking when it comes to exporting the image. It's clear that the mask is doing its job visually (the mask is the rectangle with rounded corners and masks the svg on the left and the text box on the right) and this version attached is now with the mask on the group (see post above) and the mask on the svg and text box contained within the group. I can't think how to add any more masks. I should point out that I may be a 'Newbie' on this forum but I have been using masks in Motion for about ten years now without any problem and the same period of time cropping to top on DrawPlus. I also realise théâtre any drop shadow applied does not fall within the boundaries - so I've attached the final image to show that this is not the problem in this case. The final image extends far beyond the shadow. The image needs to placed centrally in a column on a website alongside two other columns - a very common web layout - and the additional border pushes it offline and makes the layout impossible. 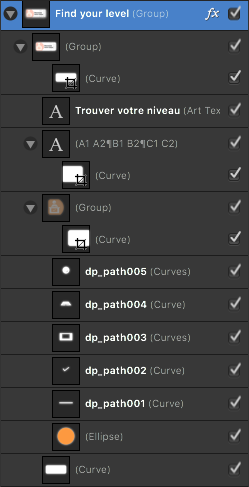 And finally ... here is the layout from the layers menu showing how I've laid it out. Hope someone can help because I'm about to return to Drawplus so I can return to meeting deadlines.